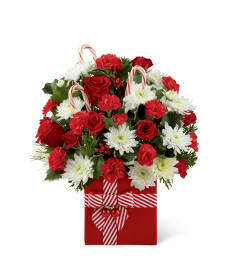 FTD® proudly presents the Better Homes and Gardens® Holiday Hopes™ Bouquet. 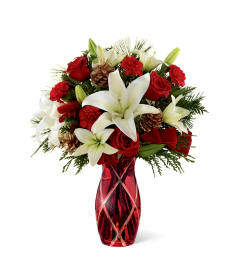 Spread the joy of the holiday season across the country with this simply gorgeous Christmas inspired bouquet. Rich red roses and mini carnations are beautifully accented with white Peruvian lilies, red hypericum berries, lily grass blades, and an assortment of lush holiday greens to create an exceptional fresh flower arrangement. 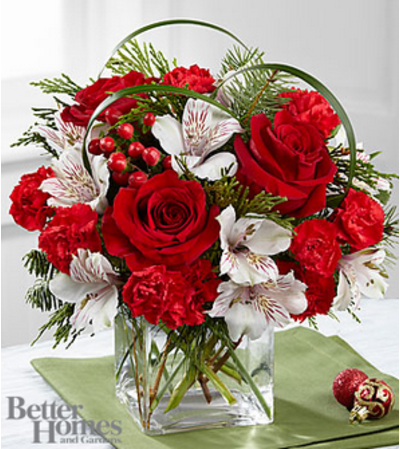 Presented in a clear glass cube, this holiday flower bouquet sends your warmest season's greetings to any of the loves in your life.